Citadels, historic Castles, cute Villages and bucolic Landscapes are on the menu. Served with a fresh craft beer, of course. A huge heritage waiting to be discovered ! This natural site of beauty was first occupied by the Celts before becoming a Roman settlement on the Roman built road joining Bavay and Trier. The Prince-Bishop of Liege had an Episcopal residence here and the town became part of the Principality of Liege in 1070. Its main development took place between the 13 th and 15 th centuries due to its remarkable copperware industry known at large as “Dinanderie”. 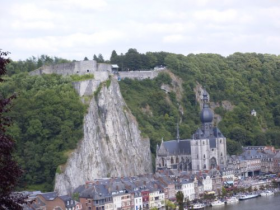 Dinant held an important strategic position on the River Meuse and has thus been the site of many battles over the years (In 1914, it sustained 17 sieges). The first major attack dates back to1466 by Charles the Bold. It was again pillaged and occupied in 1554 by the troops of the Duke of Nevers. Occupied by the French between 1675 and 1697 before being returned to the Prince-Bishop of Liège. It's during the Dutch reign (1815-1830) that it became part of the province of Namur, as it has remained ever since. Adolphe Sax was born in Dinant in 1894 - the inventor of the saxophone and other musical instruments. 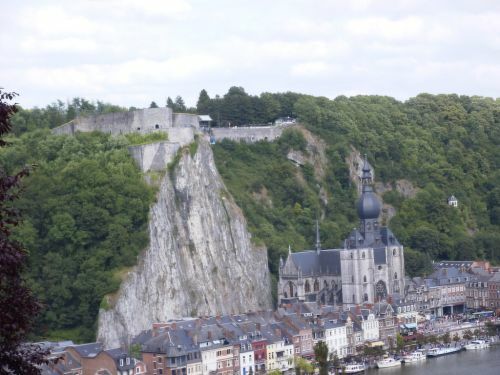 Dinant also suffered during the two world wars. Much of the town was burnt down by German soldiers in 1914 and it is only in the year 2000 that the local authorities have allowed a German flag to be flown amongst all the other European flags, which decorate the bridge across the river. Dinant was also badly hit by bombardments and shelling between 1940 and 1944. Magnificent 17th century castle and its water gardens. These Gardens, where the splendour and majesty of the French style mix harmoniously with English romanticism and Italian refinement, have been designed to unveil their treasures only little by little, gradually as the walk goes along, and to lead you from one surprise to another, along with the extraordinary diversity in contrasts. Guided visit of the Gardens. Flanked by six towers, the castle of Vêves is a typical example of military architecture in the 14th century, fully renovated in the Renaissance period. Guided visit from the outside. The origin of Celles goes back to the 2nd century. The region was evangelized by Saint Hadelin in the 7th century. The beautiful Romanesque church is a rare example from the 11th century. The crypt, located under the choir, is from the 9th century. The remains of Saint Hadelin were preserved there till the 14th Century. The German Panther tank at the Celles crossroad reminds us of the Ardennes Offensive (WWII), stopped in Celles on Christmas Eve of 24 December 1944. Guided visit of the church and the village. Lavaux-Sainte-Anne was erected around 1450 with all the defensive features of its time : moat, massive round towers, drawbridge, loopholes and a curved dike, forcing to assailants to lay in the open. By 1630, warfare had evolved and the castle was adapted it to the tastes of the day. Guided visit of the castle. The Brasserie Caracole is the last artisanal brewery that brews by means of wood-fired ovens. This unique brewery existed already in 1766 under the name of Brasserie Moussoux, then changed ownership and became Brasserie Lamotte in 1941, and was finally taken over in 1992 to become the Brasserie Caracole. Guided visit of the brewery and sampling of four beers brewed there. This 13th century medieval castle has massive walls, its towers topped with slate and a moat with drawbridge. The castle is nox closed to the public. This charming little village perched on the hillsides of a narrow wooded valley, has retained numerous (16th-19th century) dwellings and small farmhouses. Guided visit to the cave of Saint Anthony, built by the parishioners and inaugurated in 1903, and the medieval Carondelet dungeon (12th century) from the outside. Guided "helicopter view" over the Castle & Gardens of Freÿr, situated on the opposite bank of the river Meuse. Looking down from the top of the cliffs.